outlet: 4 US outlet, and 6 universal outlet. 1.focus on current order flow, minutes before class, after class, and two-way audio jack, the reduced level of pre-and audio effects to enhance resolution for force. Also has a direct socket (without filtering), to meet different needs. 2.filter coil current of the channel and cross-sectional area as large as possible, using high-quality high-purity copper wire to reduce the transmission loss, increase energy supply rate. 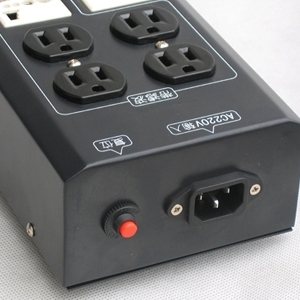 3.the use of professional-grade power outlet, copper thick, elastic, close contact, have to pay to reduce the contact of the current reflection and loss, which is an important guarantee for good sound quality. 4.the use of interchangeable power cord, ready to be upgraded according to their personality. 5.with lightning lightning and overcurrent protection devices, the use of safety. 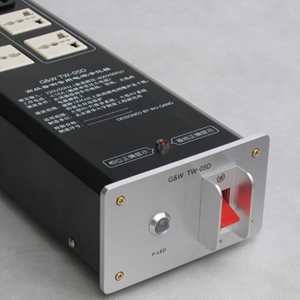 TW-05D MKII uses 15A/220V computer grade power switch, Taiwan's "goods"-shaped copper-purpose socket outlets and American standard, using the German WIMA polypropylene capacitors and Japan FDK-type large-diameter high-current inductor coil and double-thick copper thin area high-current printed circuit board and switches plus a fake "Western Electric" medical grade anti-touch aluminum fence. In the design concept, both adhering to the traditional role of power purifier filter, there are new breakthroughs. With a high current common mode filter, they can bring 29 to 50-inch large color TV, three gun projector and LCD rear projection and theater and other large hi-fi equipment, the more anti-overload, filtering is more effective, the power of purity and more high. 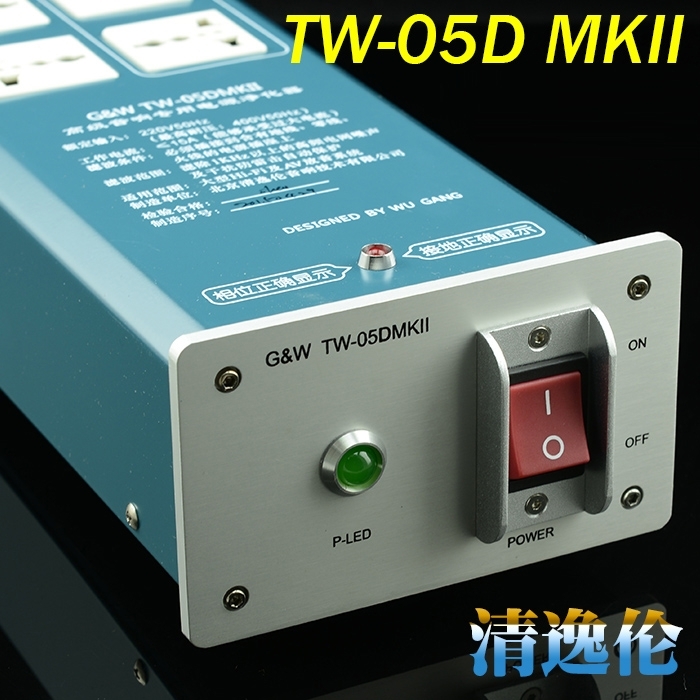 TW-05D MKII power purifier can be widely used in audio, recording power supply systems, image playback, advanced measuring instruments, computers and medical equipment and other precision equipment, power supply system. Can effectively improve the sound system of sound field width and depth, reduce background noise; enhanced color saturation and image clarity; DVD markedly enhanced the ability to read the disk. Especially for small signal on the sound system picked up, transmission and amplification, the interference filter to a minimum, make music and rich details, sound is clear and transparent results. As we all know, with the rapid development of digital technology, digital appliances and more widely, giving the work and lives of great convenience, but also to the grid disturbance caused by more serious. Daily digital interference of these appliances will not have any adverse effects, but the sound, the sound quality is so stiff. Blurring the background, status is unclear, a more sensitive high-level sound, so sound quality is greatly reduced, using the power filter to improve the sound quality is an indisputable fact. 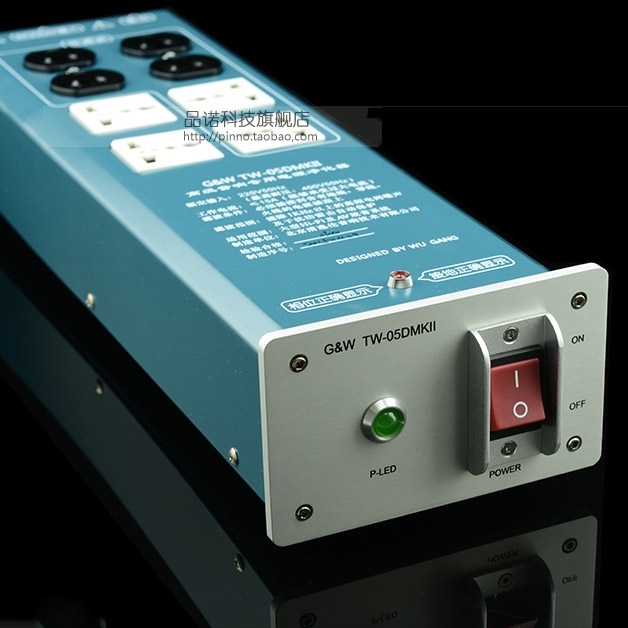 But sometimes used improperly, there will be slower, weakened the shortcomings, so the power supply filter circuit design and materials must be rigorous and reasonable. Filter design has taken into consideration the factors, but also pieces of the filter to minimize the impact on sound quality, to enhance the sound quality.